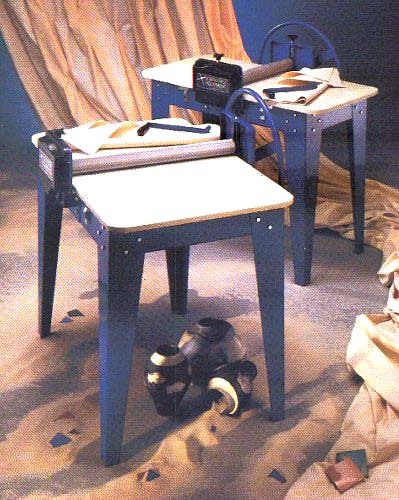 North Star 24" Super Slab Roller With 6' Table-- Includes Wagon Wheel and Canvas! 4" diameter rollers for heavy-duty use. Bodies and rollers are made of cast and carefully machined high-strength special alloy aluminum. Gears are made of steel. Bushings are nylon and the remaining parts (except plastic gear covers and knobs) are machined steel. Table frames are 14-gauge steel. Tabletops are of moisture-resistant Medex with a melamine surface. Metal surfaces are zinc plated or coated with a durable powder coat finish. Virtually no maintenance is required, and the simplicity of the design ensures that any repair ever needed will be quick and easy.